Fish and shrimp health intelligence management system-Aquaculture supplies related categories-Thingwell Enterprise Co., Ltd.
1.24-hour smart monitoring. Effortless fishand shrimp farming. No age or site restriction. The status of your pond culturecan be monitored on cellphones or computers at all time so you have time torest and reduce labor cost. Human-machine interface display. Remote control.Easy to operate. Cloud and big data repository. Daily recording and managementtransformed to “Graphical Display” so farmers can clearly understand dailychanges and perform search of them. 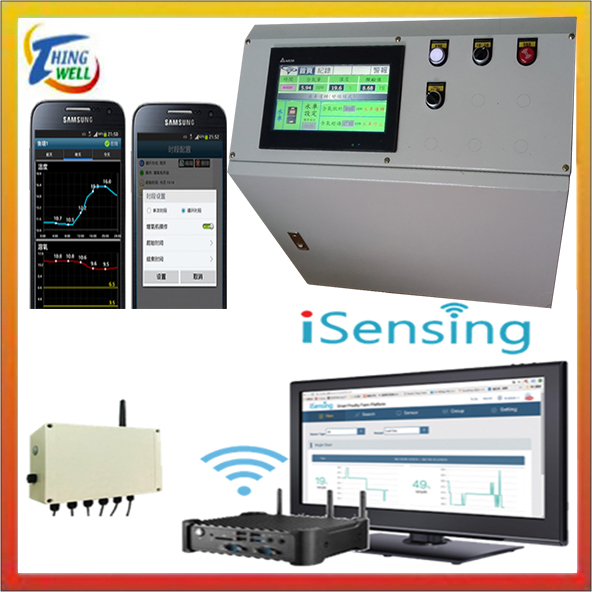 2.The smart control system can connectaerator, feeder, water thermometer, salt meter, pH meter, NH3-N meter, generator,and pond culture abnormality alarm together. It can set the demand of high orlow dissolved oxygen saturation of the pond culture. Aerators will be turned onor off automatically according to the level of dissolved oxygen saturation.Fish and shrimp feeders can be programed to change the time and quantity offeeding. 3.The aquaculture smart monitoring systemhas the advantages of electricity conservation, reduction of probability formedication, and enhancement of quality, farming efficiency, production,earnings. 4.There are solar and non-solar sensors. Application: seawater and freshwater fish and shrimp Indoor and outdoor aquaculture management. PS: Intelligent Aquaculture Management System Language, Chinese and English. It can also be customized for Spanish, Indonesian, Thai, Vietnamese, Arabic and Russian at an additional cost. 1F,No.14,Ln.661,Sec.5,Chungsin Rd.,Sanchong Dist.,New Taipei City 241, Taiwan.